What is the most exciting thing coming up in tech? I had a chat with Edouard Austin about this last night. He asked me what I thought was the next big thing that’s going to happen in tech that will make a difference. Being a social kinda person who likes connecting with others I had a quick think. What was the most exciting thing that I’d come across lately? What sprang to mind was my experience with Glancee (bought by Facebook in May 2012), Highlight and Sonar apps at South by South West (SXSW) in Austin last March. I’d been thinking for some time that it would be really cool to have an app that helps you to intelligently find people around you, I’m sure I’m not alone in that thought. It was great then to discover that everyone, well it seemed like everyone, at SXSW was using either Glancee or Highlight, with Robert Scoble saying that he prefered Highlight. What these apps do is pull in data about you from Facebook or elsewhere and then using that data and your location let you know when someone that you are already connected to or that has lots in common with you is closeby. This worked really well at SXSW because there were so many people in close proximity signed up and using the apps. When I returned home to London the next week it didn’t work as well because there weren’t that many people in London using it. The future of technology for me is all about changing the world for the better thru connecting people, then leveraging those connections to change power structures and hierarchies that are no longer relevant. Today was day 1 of the #blogbus Orange international bloggers’ tour of the Bay Area which I’ve been invited along to. Unfortunately I was ill last night with food poisoning or something similar so I missed the first half of today’s sessions. But, I did get to hear a couple of speakers and meet up with @BernardGolden which was cool but we didn’t get to chat for long enough. 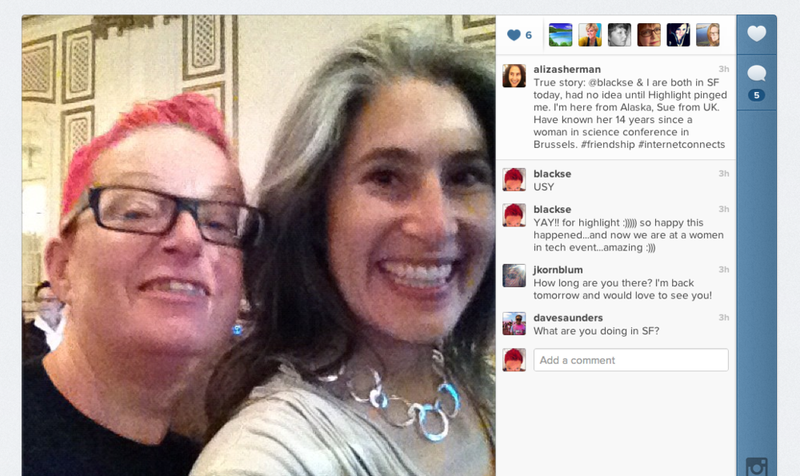 Anyway, as I was sitting in the session I got was tweeted by my good friend Aliza Sherman. Aliza and I met in Brussels in 1998 at a Women in Science conference. She lives in Alaska and I live in London, UK, so we get to see each other and hang out very rarely. Neither of us had known that the other was in San Francisco this week. Aliza was walking along the road near the office on Spear Street where we were listening to some great speakers and my profile came up on her Highlight app. Her message to me was asking if I was in San Francisco, because of course, she expected me to be in London. I replied that I was in fact in San Francisco and we arranged to meet up. How cool is that? I got to spend a lovely evening with a friend that I get to see very rarely. If it weren’t for Highlight we probably would not have realised that we were metres away from each other in the same city. For me, that is the future of tech. ← Wake up UK! We should be teaching programming from age 5!! Now the pressure is on for me to blog my side of the story 😀 so will do it this week. Promise! I think this was a great example of a non-creepy use of these apps.